Driven by her family’s devastating losses, Congolese expatriate Francisca Thelin embarks, with human rights activist Lisa J. Shannon, on a perilous journey back to her beloved homeland, now under the shadow of one of Africa’s most feared militias—Joseph Kony’s Lord’s Resistance Army. With gunmen camped at the edge of town, Francisca is forced to face a paralyzing clash between her life in America and her family’s rapidly evaporating world—and the reality that their rush to her family’s aid may backfire. 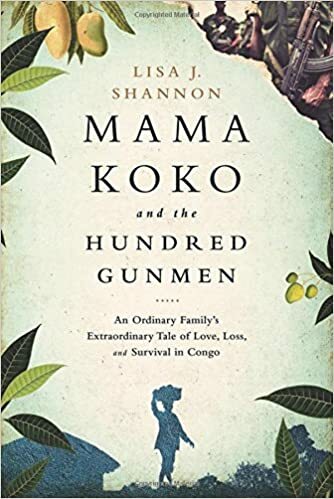 Offering compelling testimony to the strength of the human spirit and the beauty of human connection in the darkest of times, Mama Koko and the Hundred Gunmen also explores what it means and requires to truly make a difference in an unjust and often violent world. mass of refugees. When they finally emerged from hiding, Alexander surveyed the dried-up trees, the coffee beans stunted and gone to wild, the fields overgrown to bush and brambles. Dette didn’t want the coffee plantation. The land was wrecked, raided, broken to fruitless nothing. Alexander decided to reclaim it. Ngalagba had left Papa Alexander for another man ten years before. Monokoko opted to stay in Dungu to help out with her grandchildren. Toni was not up for the tedium of manual labor.